Myodocha serripes (Long-Necked Seed Bug). Size: approx. 10 mm. Photo: 09/14/11, 10 pm. A member of the Dirt-colored Seed Bug family. 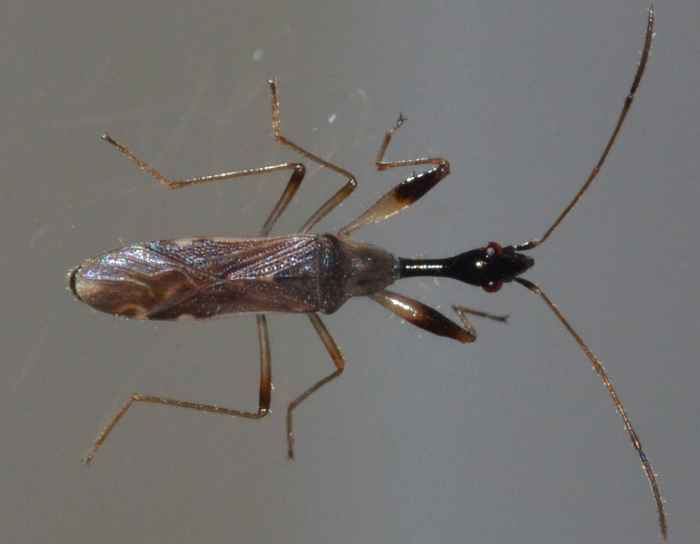 This is a Long-necked Seed Bug (Myodocha serripes). Adults of this species are attracted to lights. Their head is black and longer than pronotum; the front femora is inflated bearing spines; the legs are yellowish with black "knee" joints. They can become a pest of strawberries. There are two species in Florida (one in the other states). The base of the other species' fourth antennal segment is not black but rather a pale white.